I’ve spent a lot of time thinking about football in the last few days. I went to the Supporters Summit1 on Saturday and to an associated workshop on Supporter Liaison Officers (SLOs) on Friday. On Sunday I went to the Blues Trust Open Meeting. I don’t have time to write about all the ideas that are buzzing round my brain at the moment so I will just note some of the things that stood out. I was encouraged by the best-practice stories I heard, which illustrated the common interests of clubs and supporters. What’s good for fans is also good for clubs and the game. At the same time, it was clear that British clubs can’t just copy best practice models from other countries; we have to come up with something that will work for us. Tim Connolly, VP Sales and Marketing for the Green Bay Packers, told the most compelling stories of fan engagement that I heard. Green Bay Packers is an American football club that has been publically owned since it was founded in 1919. It was set up in a way that made it impossible to move the club away from Green Bay or to profit from selling it. It is embedded in the community and enjoys unprecedented fan engagement. Every home game since 1960 has been a sell out. The stadium has just been expanded to hold 79,000, the population of Green Bay is 102,000 and there are 106,000 on the waiting list for season tickets. The Green Bay model could not be replicated in British football clubs; it was created in a different age. It also plays in a different league with rules that are designed to preserve the competitiveness of the game. The owner of a big club, the New York Giants, helped to put those rules in place. He said that if the big clubs didn’t share the TV revenue the Giants wouldn’t have anyone to play in 50 years’ time. The owners of the big football clubs in England didn’t take such a long term view. They decided to form the Premier League so that they could keep most of the TV money and make sure they remained at the top. In the opening plenary session on Saturday, Andy Burnham M.P. described the formation of the Premier League as the moment when the Football Association gave away their power and said that he would like the FA to regulate the game rather than being ruled by the money men. During Andy’s impassioned speech I found it quite interesting to watch the expression on the face of the previous speaker, David Bernstein, Chairman of the FA. Andy suggested that football should have its Leveson moment and that there should be a royal charter to underpin the regulatory powers of the FA. David Bernstein asked to say a few words in reply and though he didn’t agree with every detail of what Andy said he did say that Premier League success has led to an imbalance in the game. One of the questions asked at the final session of the Supporters Summit was, “Is our last chance of improving football slipping away?” I think most of the fans there would say, “No, but we have to do something soon.” The lack of competitiveness and the financial instability of so many clubs is posing a threat to the game. It was easy to feel hopeful sitting in those meetings, surrounded by several hundred fans who were there because they cared enough to want to do something. It wasn’t so easy to feel that way at the much smaller gathering of Birmingham City fans at the Blues Trust Open Meeting on Sunday. The problems at the club seem so great and fans prepared to do something seem so few. But I do believe we can make a difference if all fans work together. We are never going to agree on everything but surely we can agree that we want to save our club. And we can join with fans of other clubs to protest against the greed that is ruining the beautiful game. The photo3 at the top of this was taken at St George’s Park, the England Football Centre, where the summit was held. 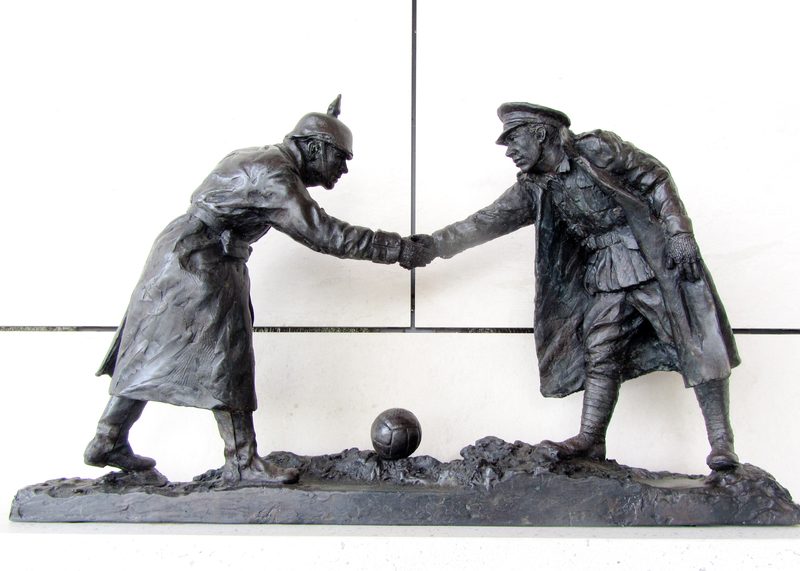 The small statue is called All together now and it commemorates the day, Christmas Day 1914, when British and German soldiers stopped fighting and played football. Football can bring people together. It has sociological value; it shouldn’t be just about money. ← Strategy quibbles What do you want?